?Do I Need A Witness For My Louisiana Disability Hearing? Doctor (or Nurse): How are you feeling today? This brief exchange happens at just about every doctor’s office visit and sets the stage for an unhelpful medical record. Without thinking, you respond in a way that can and likely will be used to discredit your medical evidence. And it happens without even a thought. You do not want to be viewed as a complainer, or you’ve become accustomed to your symptoms and don’t think you need to bring up things that have already been discussed. When you are sick or injured, only you truly know and experience the full extent of your limitations and your pain. Even your doctors and the nurses you see regularly do not really know how you feel. Only you know exactly what you are going through. And it is up to you to convey that at each visit, each appointment, each interaction with anyone at your medical provider’s office. The fact of the matter is YOU ARE NOT OKAY and YOU ARE NOT FEELING FINE. You are at the doctor’s office because you are dealing with a severe medical issue that has caused you to seek treatment. If you were okay or fine, you would not be at the doctor’s office. 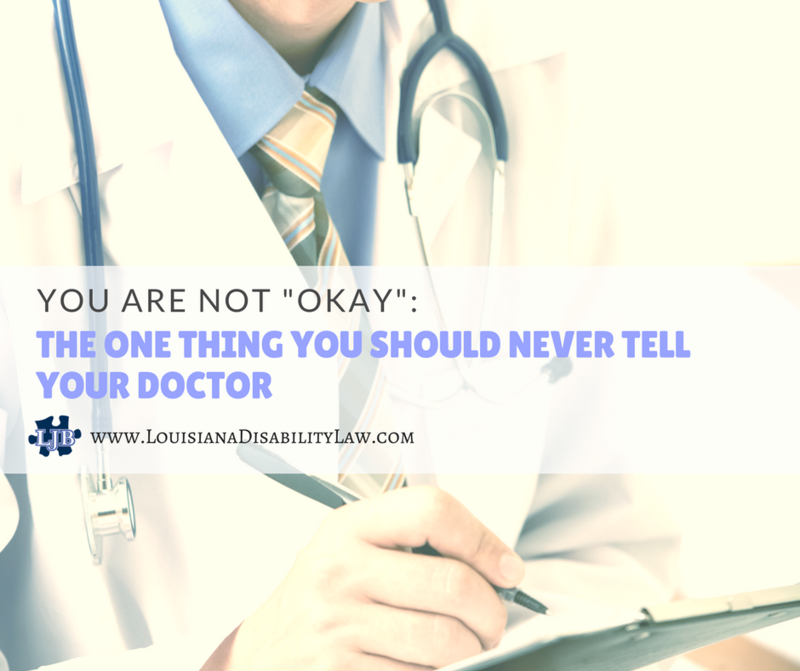 You should never say “okay” or “fine” or any other such words when asked how you are doing by anyone at a doctor’s office or hospital. While you will eventually have the chance to describe your illness during the disability process either to a Social Security doctor and/or an administrative law judge, this is not legally enough to prove that you are disabled. You need solid supporting medical evidence from your continued treatment for a successful Social Security disability claim. Records that continually say “Patient doing okay” or “Patient feeling fine” will not help and in fact, often disable your disability case. You cannot go back and fix this. If you are sick or hurt or in enough pain to go to the doctor’s office or hospital, make sure you express this to everyone you come in contact with at the facility. Many people fail to adequately describe their pain, symptoms, and other limitations in detail. Be different – give your doctors/nurses/medical providers all of the details about your pain, symptoms, and limitations. Make sure your description gives specifics about where, how much, how often, and what activities the symptoms limit you from doing.